Feeling safe again is often the healing and elusive aspiration of a person like me. I have been living with the deep and cellular residuum of sexual trauma for most of my life—over thirty of my going-on forty-six years. For many years, the grief and shame of losing my innocence cultivated an intense orientation to life’s doing. Safety for me back then was activity, noise, frenetic schedules, and a constant soundtrack to my life that meant I never had to be quiet with myself. Safety was in the predictable metrics of success that I could use to measure my self worth. I never had to stop and admit that I didn’t feel safe, ever. I got a lot done all those frenetic years and my diligent efforts were affirmed with everything from scholarships to awards to pay raises. But, trauma does not allow itself to be ignored. It demands attention. Its cellular ghosts haunt their host. They must be acknowledged, sometimes cast out, sometimes befriended, other times adapted or transformed. My trauma is tethered to the violence of a dangerous world, a world that knows no boundaries when it comes to annihilating innocence. How can I be safe in this kind of world? How can any of us? Safety is about protection from harm. Safety is about insurance against danger. Sexual trauma shatters any sense of safety a person use to feel. The shattered pieces penetrate the deepest parts of who we are. We are not safe in life’s most intimate spaces, we are not safe in our own bodies. The truth is that trauma lifts a veil on something that is true about our condition as sentient beings—on some level we are always in peril. My horses, my dogs, my cats, and the snake my son has all navigate this reality. They all have their ways of making a life in the midst of the constant threat of peril. Some are more vulnerable than others. Even though they are the biggest and strongest of the animals I care for, my horses are the most fearful of these creatures. Horses are habitually fearful—everything is something that could potentially do them harm, from a plastic bag blowing in the wind to a coyote hiding in the brush in the woods. Connecting with a horse is about building trust and cultivating confidence in these beautiful creatures that they are ok with you, they are ok in this space, they are ok in this moment. But even with all the trust and training you can give a horse, the right trigger comes along and they will go into survival mode. For horses this is flight—they run, fast. Horses are intuitive enough to learn how to trust at the same time they remain always vigilant. They are herd animals and so need a community to help them feel confident enough to graze. They are prey animals and so they need an exit strategy should a predator come around. My horses embody an honesty I need around me. They show me everyday how lack of safety and life-giving trust can coexist. And life is richer when there are more sources of trust, more layers of connection to cultivate. Assuming we can secure the assurance of safety may well be a construct of privilege and power. My whiteness and my economic resources give me ways to create the assumption of safety. From the resources to purchase a car that has good breaks and working seat belts to the opportunity to choose what kinds of food I buy, my privilege gives me pathways to better odds when it comes to certain hazards. And my whiteness gives me another kind of security in some situations even as my femaleness also creates insecurity in some of those same contexts. The more resources and social capital you have, the more complex your safety measures can become. The elusive quest of safety can also morph into norms and institutions. Walls make us safe, locks make us safe, guns make us safe, and having more and more might, more and more power make us safe. And the brutality of trauma retrenches itself again when those who we are told will protect us from harm are the ones who hurt us, the ones we cannot trust. Living with the remains and the repetitiveness of trauma tells me the truth about some things even as it threatens to diminish me with the lies it tells me, too. I am never truly safe, that’s true. But it is a lie that I should stop allowing myself to be vulnerable. I am permeable to harm that can be devastating, that is true. But it is a lie that I cannot find vitality in this dangerous world. All intimate connections are risky, that is true. And some are more than others. But it is a lie that I should trust no one. I have intuitions I need to pay attention to about when to feel more open and when to seek ways to protect myself, that is true. But it is a lie that I need to craft a tiny world for myself to be as safe as I can possibly be. Safety is not a familiar sensation to me, but trust and openness are. 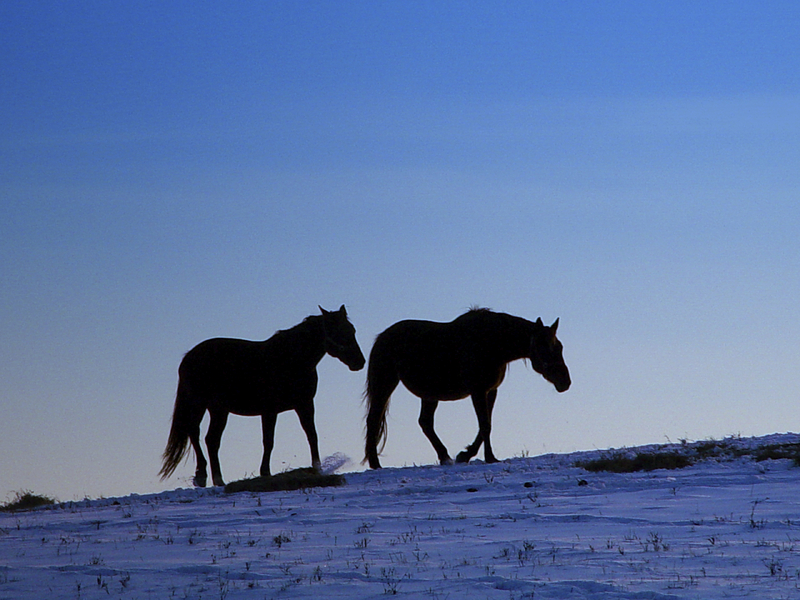 Like my horses, I learn and relearn how to drink in trust and calm in the midst of peril’s proximity. The brutality of violence and betrayal are no strangers to me. And neither is the wonder of regeneration in this always pregnant world. Navigating safety and vulnerability in this dangerous and fertile world is as immediate to my days as breathing is. With one deep cleansing breath I am at once at ease on the planet and tangled up with unspeakable vulnerability of all that breathes with me. Safety is not what fills me in the potent oxygen of our creaturely condition. It is connection that does. The poetics of dividing cells and shared realities, the meandering eruptions of delight and joy, the solace of affection and fidelity, and the startling tenacity of love stitch their way through the vulnerability that defines sentient life–mine, yours, ours. Marcia Mount Shoop is a theologian and Presbyterian minister who lives in West Lafayette, Indiana. She is the author of Touchdowns for Jesus and Other Signs of Apocalypse: Lifting the Veil on Big-Time Sports (Cascade Books, 2014) and Let the Bones Dance: Embodiment and the Body of Christ (WJKP, 2010). At www.marciamountshoop.com Marcia blogs on everything from feminism to family to football. Beautiful meditation on the fragility of life, the ability to acknowledge having been violated, and the delicate balance life becomes after that. Thanks. Thank you, Carol. I appreciate your affirmation. The last paragraph in your meditation presents so much good wisdom and maturity. You truly navigated the challenges magnificently. Well done, great post. Thanks Marcia. Thank you, Sarah. The journey continues. And I trust that more challenges and growth will come along the way. Thank you so much for this wise and beautiful post. I appreciate the litany of “that is true, but is is a lie.” That crucial process of discernment leads to courage and freedom. Thank you, Elizabeth. I have found that the meandering emergence of wisdom is deeply embodied and often times beneath and beyond cognitive discernment. I am thankful for the awareness that bubbles up sometimes that helps me find words and have new clarity. I am also profoundly thankful for the way my body has been able to practice and regenerate in ways that have given me embodied sensations of trust and connection. I agree that there is freedom, life-giving space there. Thank you for sharing your thoughts here, too. Thank you for this, Marcia. It is so true that by its very nature, vulnerability opens us to pain, but without it, we are closed to the joys of connection. Without true connection, where is the true value in life? Thank you for your comments. Amen to the profound necessity you place on connection. That is the life-line, that is the well spring. As a survivor of trauma I totally relate to what you are saying here. I especially like your references to the horse in the context of being strong while at the same time being wary. Some time ago I read an essay that dealt with the spiritual and emotional connections between horses and women. Your essay brings this connection a wonderful new life. We are stronger than we think we are most of the time and just because we are watchful and wary doesn’t mean we have to hide away to find safety. We can take courage in the fact that we are much like the horse in this respect. We can stand boldly in the open field knowing that if the need arises we have a means of escape, a source of retreat. Thank you for this wonderful reminder that life can be full and good even in the midst of ‘peril’s proximity’. Thank you for your response. I am thankful for the resonances you share. And I love the image of “standing boldly in an open field” and knowing we can find a “source of retreat.” Beautifully said. Being around horses, and other animals, has been very healing for me. Horses in particular embody this grounding wisdom that has been a great source of growth and wisdom for me. Thank you again for reading and for sharing some of your reflections. Link to or title of article? I would like to read and share it with others. Can you tell me more about what link you are looking for? I am not clear on your question. Many thanks for your response Marcia. I would like to read the essay to which treetalker52 referred. Is there a link? Thanks for clarifying, John. Great question! I would love to know if there is a link. too. I hope treetalker52 will let us know. All of my “data” on the connection between horses and women come from first hand experience. I actually was a part of a women’s riding group several years ago called “Women’s Intuitive Riding” that was a wonderful collective experience of something that is usually between just me and my horse. Sorry it took me so long to get back to you, John. I’m sorry but I can’t remember where I read this, it was quite some time ago. This post just brought the memory of it back to me. Marcia, thank you. Your post is just beautifully written and so rich. I feel like I have been given a gift in reading it. Thank you. Thank you, Xochitl, for reading and for responding. It is a gift to have a community to respond and reflect on something that comes from my heart and soul. A very wise post. I love how you interweave the contrasting ideas of ‘safety’ and ‘trust’, the ability to hold two contrasting ideas in your head at the same time and make sense of it all. And how much wisdom you have learned from your horse companions! Thank you for this. Thank you for your affirmations. I am thankful for your words. My horses have helped me to learn in a deep, cellular way that safety and trust are visceral sensations that my body can hold in a life-giving way. I wish I could show them my gratitude enough for that gift. Thank you, again, for taking the time to share your reflections.